Welcome one and all to an adventure through the plane of Dominaria. This is Lore Seeker, an article series devoted to the legends of Magic left out of the main story from Wizards of the Coast. Piece by piece, we’ll explore a flavorful playstyle and dissect the elements of each awesome creature. It’s time to break out your spellbooks and component pouches, because we’re casting spells! In this installment we are building around Adeliz, the Cinder Wind. Adeliz is a Ghitu Wizard who studies at the Tolarian Academy. She often surprises her instructors with unexpected twists on Tolarian spellcraft. For reference, the Ghitu are a nomadic human tribe native to Dominaria. Adept at fire magic and artifice, this Warrior tribe has incredible resilience and resolve. Their high degree of skill for crafting magical artifacts has lead to quick to build/take down and highly durable camps. 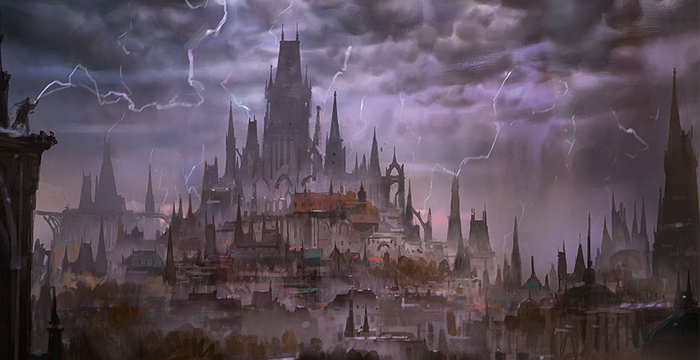 Additionally, the Tolarian Academy was started by Urza and Barrin to train an army to aid in Dominaria’s defense against the Phyrexian invasion. 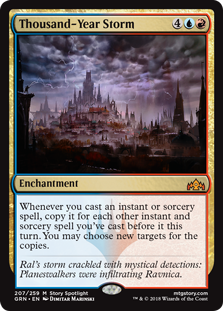 Though the original school was destroyed, there are new campuses across Dominaria today instructing a wider array of magics. The trail of story breadcrumbs was especially weak with the character of Adeliz. We’re going to add something a little different for her, to add some spice and give her a way to break the traditional spellslinger mold. What’ll we be using? Tokens. It’s not the most ‘out there’ concept, but certainly not the first thing that comes to mind for a spellslinger. DM Cross mentioned a similar take on Adeliz in his Uncommonders series. We have ulterior motives for those tokens, but we’ll get into that later. This will help create that twist on Tolarian spellcraft that Adeliz is known for. To embrace Adeliz’s inner Ghitu Warrior, this is going to be an aggressive deck. She is a low-cost evasive creature that is sure to pump out some serious damage. Tempering that aggression, we have the teachings of the Tolarian Academy. There, she has learned to spread her influence of power to others rather than just using that power for herself. Adeliz maintains a smoldering passion that burns without flame. ‘Cinder’ evokes a sense of potential energy and a source of internal power. The feelings that Adeliz holds onto come from her background as a warrior of the Ghitu. Her command over fire was refined when she was taught at the Tolarian Academy to hone her skills and maintain the steady burn of her power. We’re going to unlock that power with this deck. She will be able to deal consistent damage through Brute Force and other thematic combat tricks. 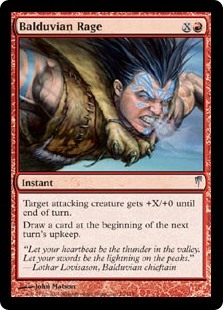 It is ideal for these combat tricks have the additional benefit of drawing us a card, but it’s not mandatory. The continual drawing of cards creates a nice parallel with the wind; it’s a force that ebbs and flows, but is always present. Balduvian Rage portrays a moment of immense passion and power, it draws a card, and it makes Adeliz stronger; a perfect storm. Soul’s Fire is one of the only removal spells in the deck and it is here for flavor reasons. It isn’t a very good rate, but has the potential to do some serious damage to a player. Red: Red acts on its gut and follows its heart. Red wants freedom, not only for itself but for all. It seeks quick, physical answers and is willing to take action to ensure everyone is able to act however they wish. Blue: The purpose of life for blue is to learn what you want to be and how to achieve that goal. Information is key; a Wizard must collect as much knowledge as possible. Blue is controlled and calculated. Izzet: Red acts, blue reacts. Red is impulsive while blue examines all angles. 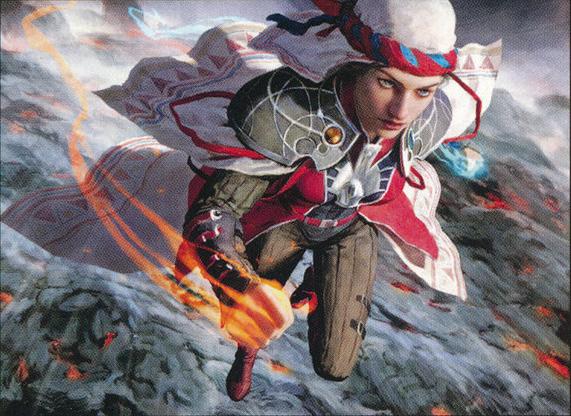 Izzet embraces the charge of emotion and channels that into ideas and thoughts that would never be encountered by a mono-red or mono-blue mage. 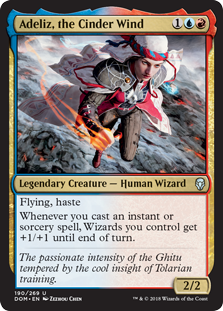 Leaping from one crazed experiment to another, an Izzet mage is able to spend much time studying, but will abandon fruitless pursuits for more fertile experiments. An Izzet mage is able to hone their emotions into a tool for discovery. 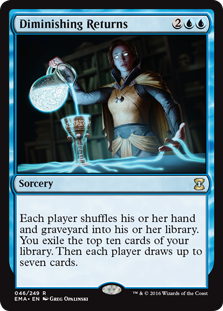 The flavor text on Beamsplitter Mage embodies the Izzet mentality of this deck: “The Izzet love replicating results.” The deck we are building will be very consistent and play the same way every time. From a flavor perspective, this shows mastery. From a gameplay perspective, this could be kind of boring. The sameness can be avoided by tutoring for a variety of cards rather than the same ones each game, or by removing tutors and replacing them with extra card draw. When one experiment is concluded, make like the Izzet and move to the next test. A Ghitu-garbed Wizard with glowing fists, one blue and one red, soaring above a field of smoldering volcanic rock. 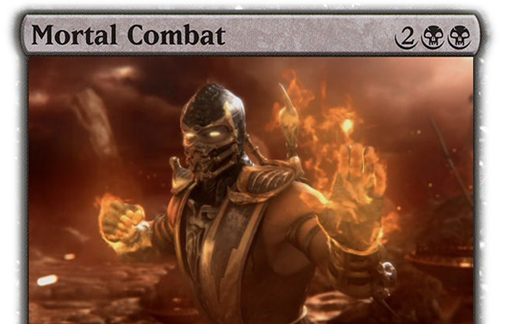 This art reminds me of Scorpion from Mortal Kombat, a fire-fisted, flame-wielding fighter. 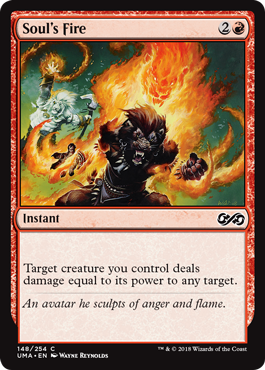 The Ghitu are Warriors and, according to the flavor text on Firefist Adept, “The ‘fiery gauntlet’ is among the first spells young Ghitu mages learn.” As previously stated, the combat step is going to be very important for this deck. We will hopefully be able to attack with Adeliz every turn she is on the board, and if everything goes according to plan, we will also chain a lot of small spells together to hopefully get some K.O.s with Adeliz herself. At some point in the game, we are going to play out our entire hand, so let’s look at ways to build that super-smash meter filled back up. 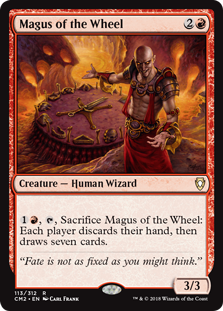 Magus of the Wheel, Day’s Undoing, Windfall, Diminishing Returns, and Reforge the Soul refill our hands to launch another barrage of blows. Some are better than others; Day’s Undoing ends the turn so we miss out on the buff it would give Adeliz. Windfall can whiff, but at times it can get you a huge number of cards (especially after a well timed Cyclonic Rift). Some pretty basic creature types, but Adeliz’s Wizard type plays a role because of her rules text. She gives all Wizards +1/+1, which means she buffs herself as well as the team. This deck is loaded with cantrips to buff up our champion. The group buff will come in to play as well on occasion, boosting the entire team to staggering levels of damage output. Basically a group Prowess. Admittedly, I am not running a huge number of Wizards, but we’ll augment that with our token package. When I think of a spellslinger that wants to use cantripping combat tricks, I think of Zada, Hedron Grinder. A Zada deck wants to flood the field with creatures, then target Zada with a cantrip. 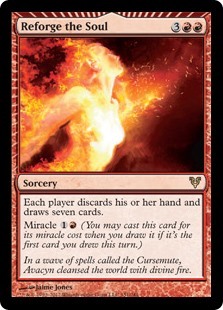 This copies the spell a bazillion times, including the ‘draw a card’ effect, and fills our hand for very little mana. This makes it incredibly easy to chain together cantrip after cantrip. This will be the main ‘combo’ in the deck. 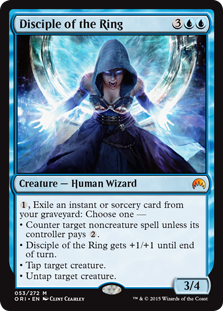 For redundancy, Beamsplitter Mage is a mini Zada effect and is a Wizard itself. Thousand Year Storm mimics this effect as well. 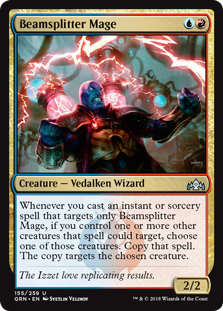 I’ve included a number of tutors to get these pieces as well: Vedalken Aethermage is a neat card that will get us Beamsplitter Mage. Gamble will get us anything we need (probably Zada), though it can cause some frustration. Muddle the Mixture will find us Beamsplitter as well. 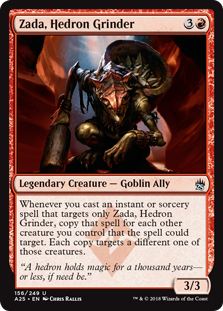 Beamsplitter is not as strong as Zada, but it is easier to tutor for and will help us find Zada to really combo out. 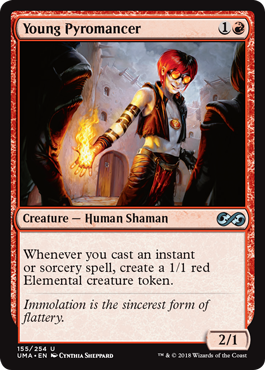 This fits seamlessly with the Izzet mentality and it reaffirms the conclusions we made when analyzing Adeliz’s name. 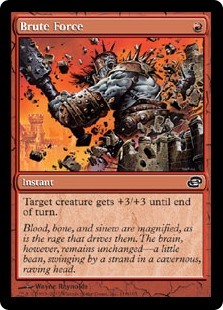 The Ghitu are connected to red mana. Their control of fire (and the nomadic nature of the group) exemplifies red’s wanderlust and desire for freedom. The rigorous training at the Tolarian Academy has focused this wild Ghitu mage into a refined Wizard, aligning Adeliz with blue mana. Now that we’ve figured out the framework, let’s take a look at that special token twist. The primary source is Talrand, Sky Summoner and his ilk: Murmuring Mystic, Docent of Perfection, and Young Pyromancer. Empty the Warrens takes the cake as the strongest token generator when joined by a high Storm count. Finally, I’ve always wanted to try out Rise from the Tides, and this seems like the perfect place for it. Hopefully, after unloading your hand, you can pop this off to get between 6 and 10 Zombies at any given time. In order to fully capitalize on the larger team size, Arcane Adaptation and Xenograft have been included to make everything a Wizard so Adeliz can buff them up. She’s a knockout smash! Adeliz, the Cinder Wind is an incredibly aggressive card and her story backs that up. A fiery disposition, disciplined training, the point where focus meets power. There are a lot of moving parts in the deck, and getting everything in place can take some work. Adeliz is the first reader request to be covered by this series, and it was so much fun to research this character, so keep the suggestions coming! Eric is a professional hobbyist and nonprofessional game designer; a promoter of mass land destruction and legitimate MTG addict. He can be found... somewhere in Minneapolis usually.